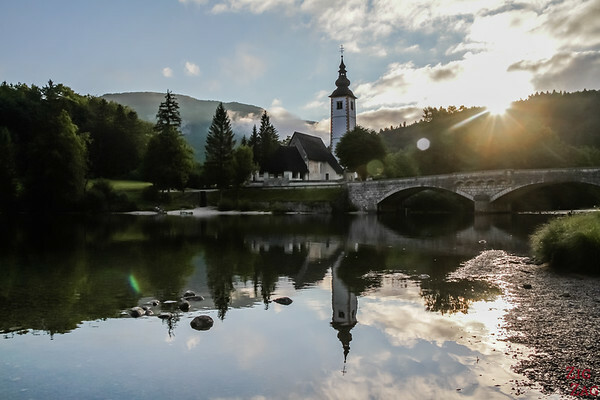 Despite being close to the famous Lake Bled, Lake Bohinj Slovenia has remained wilder and less touristy. It is a beautiful gem surrounded by the mountains of the Triglav National Park. It is such a peaceful place! 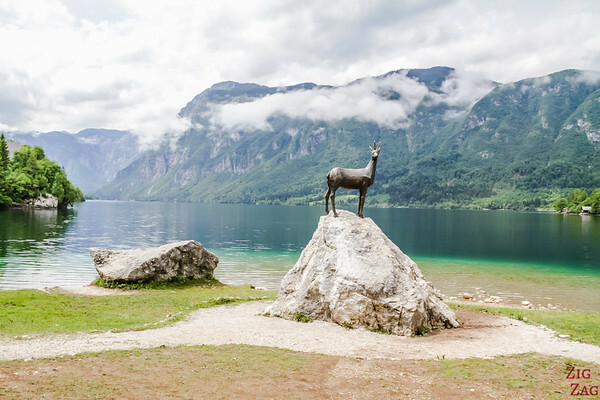 If you love Nature, don't miss a detour to the Bohinj Lake. 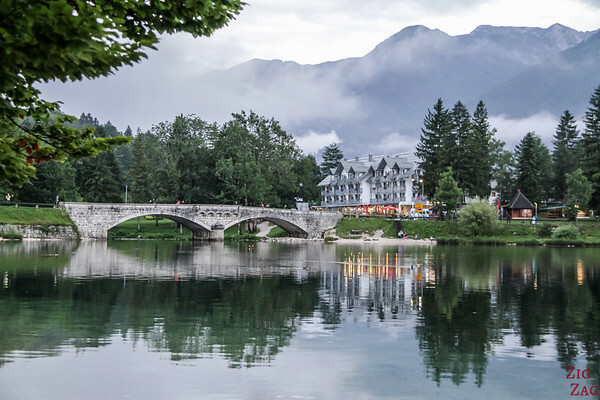 So here is my Guide with: lots of pictures, the best things to do at Lake Bohinj, suggestions of Lake Bohinj accommodations and practical information to plan your visit. 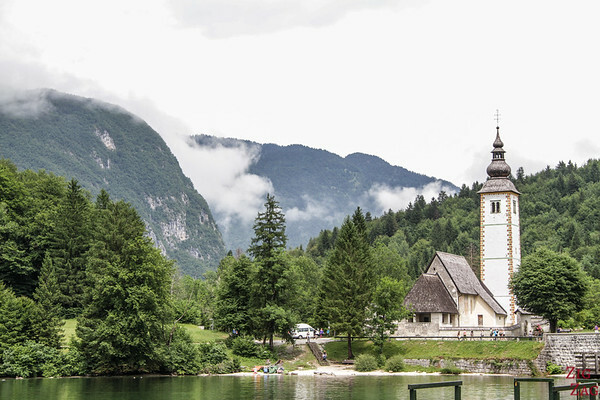 Wondering if you should go to Lake Bled or Lake Bohinj? Both have a lot to offer and are part of the wonders of Slovenia. So here are your options depending on what you are looking for. 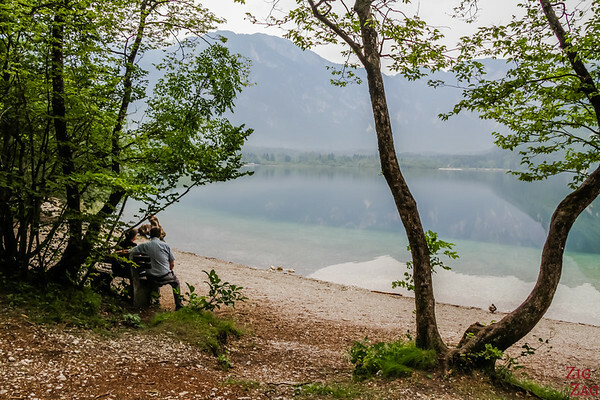 It is really difficult to capture the majestic and peaceful feeling of Lake Bohinj in photos. But here are 4 of panoramas from different location and with different weather to help you get an idea of what you can expect. 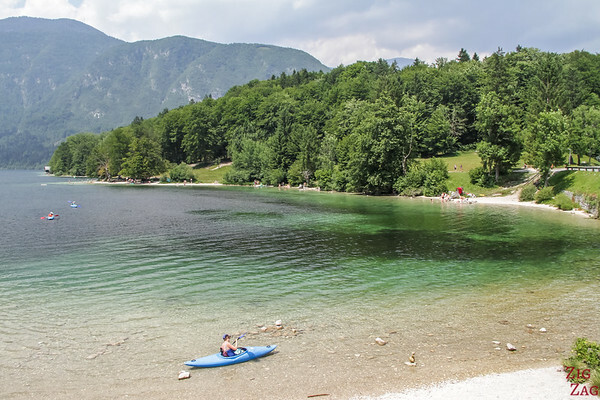 And in between I have listed a few fact to help you learn more about the Bohinj Lake. 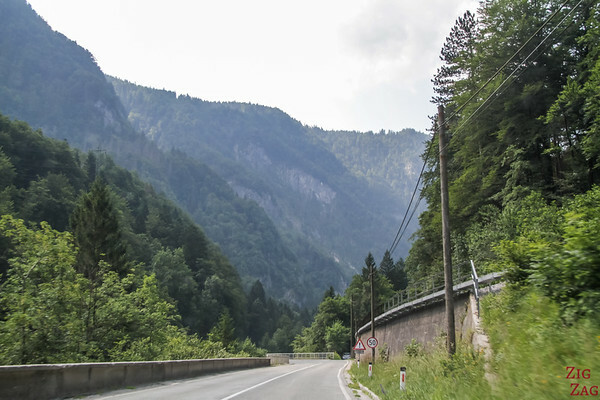 The locations in this article, along with many other beautiful places, are included in my eBook: The Road Trip Guide-Slovenia. 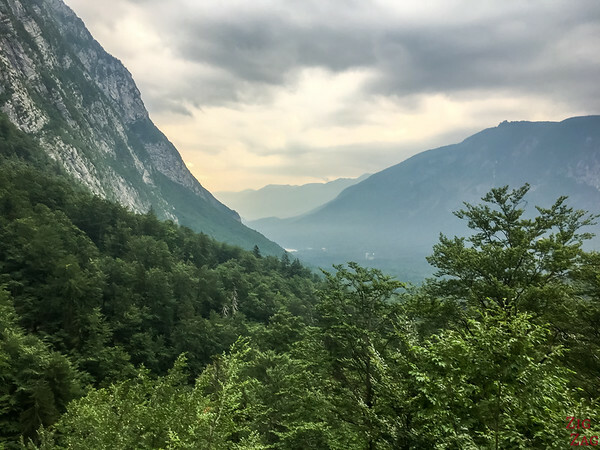 Bohinj is sometimes refer to as the lake at the end of the world, because it is niched in the heart of the Julian Alps with only one way in or out by car. 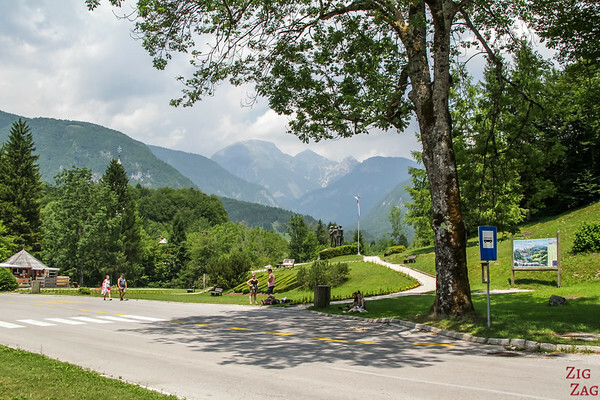 If you are limited in time and staying either in Ljubljana or in Bled you can book an organized tour that will take you to both the Vintgar Gorge and Lake Bohinj on the same day. 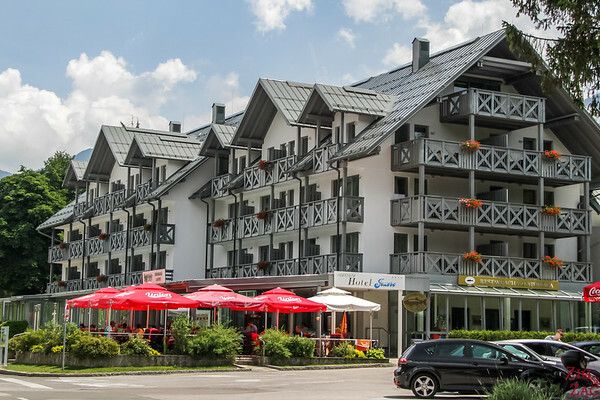 Stay at the East end of the Lake in the Towns of Ribcev Laz or Stara Fuzina. There is a large hotel and a great selection of guesthouses and apartments. The pros is that you have access to several restaurants and are very close to the lake. 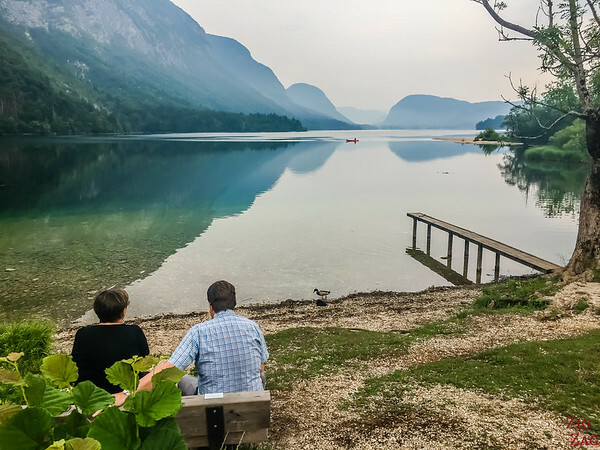 Stay in Lake Bled and do day trips to Lake Bohinj - after all it is only 30 minutes away by car - Check out my suggested Bled accommodations in my Lake Bled Guide. My personal choice is to stay around Stara Fuzina so that you can enjoy the lake at sunrise and sunset. My second choice would have been Ukanc to be more isolated in nature. It has the best location with views of the lake and/or mountains from the balconies. I personally stayed in a nice apartment (Apartments Kovačič) with 1 bedroom and a sofa bed. It is not the most modern but it was clean, spacious and with an amazing view from the Balcony (as you can see on my photo). 5min walk to the Lake shore. 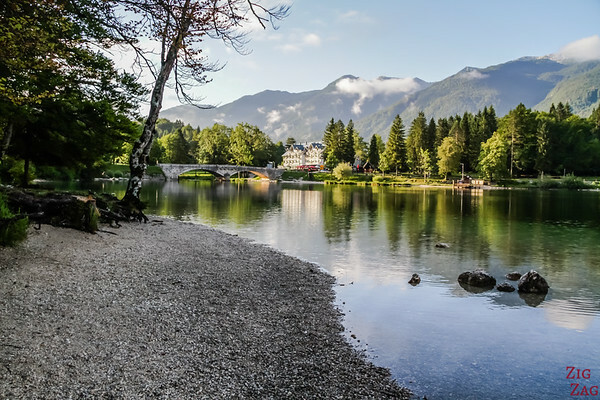 I think the best thing to do in Lake Bohinj is simply to walk around and enjoy the views from the shore. You can walk all around the lake. It is 12km and tales 3 to 4 hours depending on how much you stop. On the North shore, you are walking right by the lake as there are no construction, the mountain start climbing. However the hike on the South shore is less enjoyable. You walk on the other side of the road. They created an elevated pathway, which is better than just walking by the road but it is not the best for the views. Don't forget to cross the road at the parking to enjoy views from the mid-beaches. As you can see in those pictures in the beautiful from every angle. Even if the weather is not good, you should go out. The white views from Ukanc were splendid and it stopped raining right when we walked there! 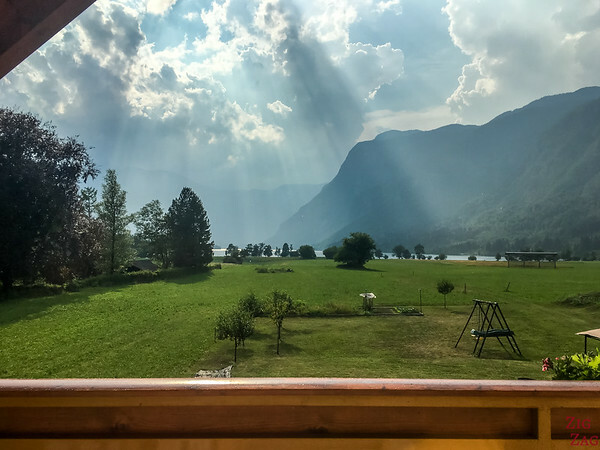 I could stay hour admiring the magnificence of the scenery of Lake Bohinj. By the side of the lake you can see a status of the famous Zlatorog a.k.a Goldhorn. It is a legendary creature and icon of the Triglav National Park. The creature, a white chamois with golden horns, is part of a fairy-tale passed down from generations. You can read the original story as written by Karel Dezman here. The statue is located on the South East shore, not far from the bridge. 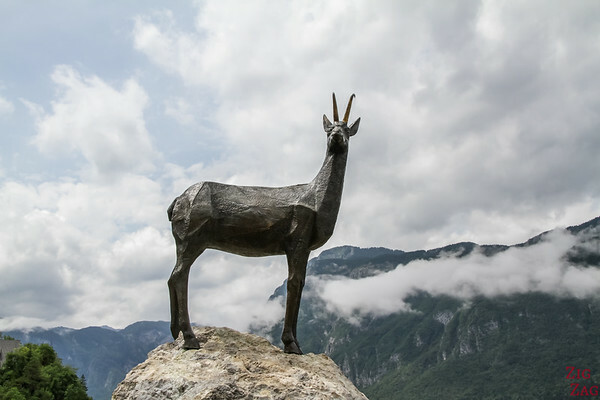 But I must admit that the statue at Lake Jasna has more impressive horns! 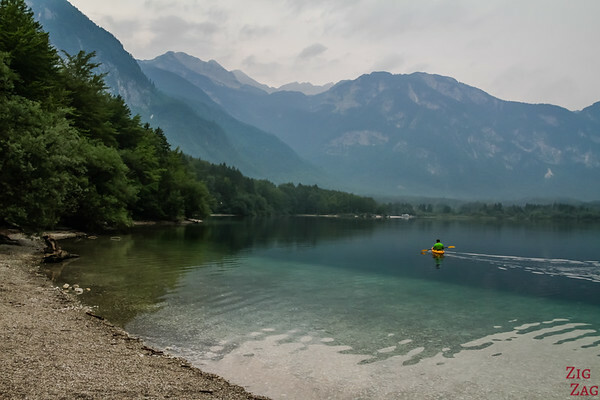 Lake Bohinj is really great for water sport. However as I said before, the water is quite cold except in summer peak. So people enjoy it more kayaking or on boats. I really recommend kayaking to enjoy the serenity of the area and appreciate the mountains in every direction. And as I told you in the facts, there are lots of fishes, especially trouts, so you can rent a boat and go fishing! You can obtain permits from the tourist office. Near the bridge at the East end of the lake, in Ribčev Laz, you can't miss the very photogenic little church. It is really charming. It is called St John the Baptist. 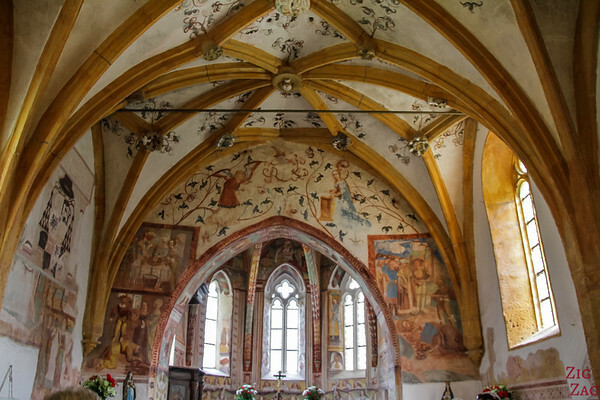 Take the time to enter to admire the frescoes. It dates back to before the 15th century. 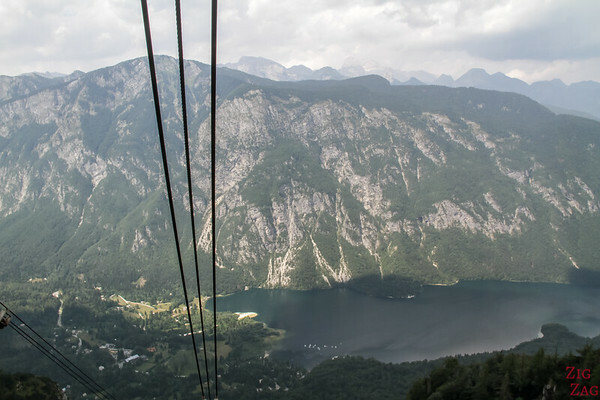 One of my favorite activities at Lake Bohinj was riding the Vogel cable car. The ride is very steep and impressive but you get wonderful views of the whole lake and the Julian Alps. On a clear day you the Triangular-shaped Triglav summit stands out above the others. From there you can go hiking on the trails replacing the ski slopes in summer or you can pay extra to take the chairlift and get even higher. However I wish they had done a better platform with the views at the top of the Bohinj cable car ride. 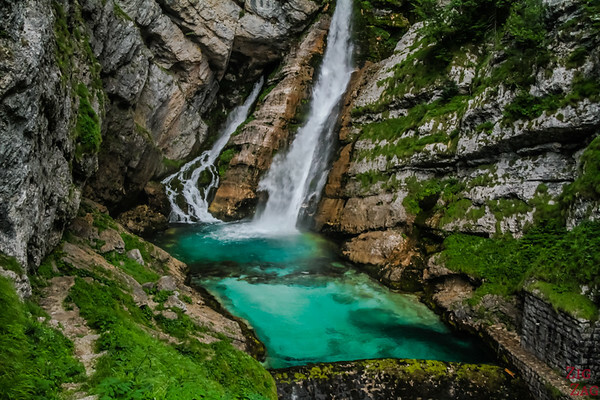 Another famous location around Lake Bohinj is the Savica Waterfall. It is located at the Western end, above Ukanc. 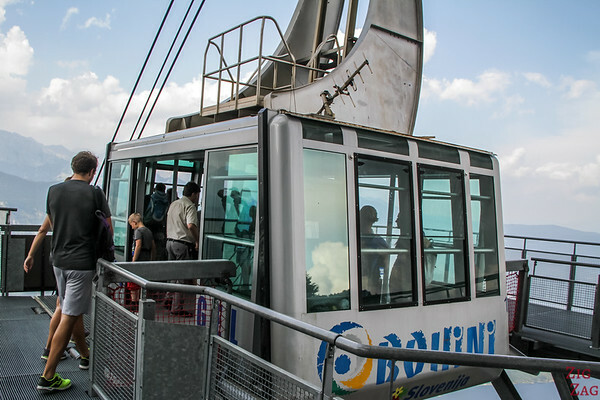 You have to pay for parking and for entrance and then climb 550 steps to reach the viewing platform. One one side you see the mountains and a little bit of the lake, and on the other the surprising slap Savica. It is an A-shaped waterfall that starts in the middle of the rock wall (from underground river) and falls into an emerald pool. It is worth the climb. 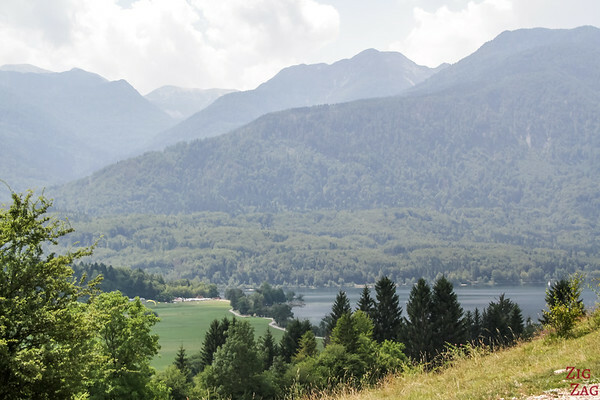 Lake Bohinj is a fantastic place for hiking. There is a large choice of trails. Some easy and short or long treks to the summits of the National Park (including Triglav). I recommend heading to the tourist office to learn more about the different trail and get a Lake Bohinj walking map. An easy one is the Mostnica Gorge, above Stara Fuzina. 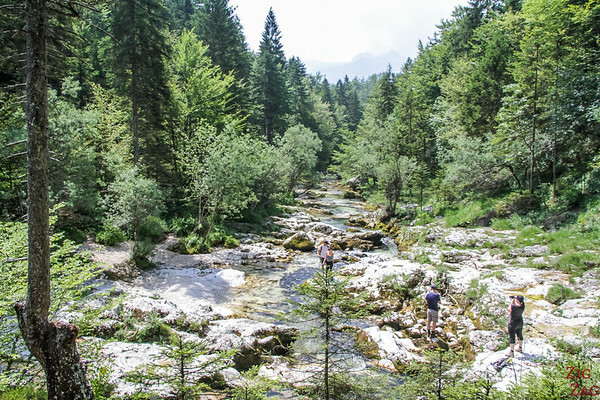 It is not as fascinating as the Vintgar gorge in Lake Bled but it offers some interesting features along the way and, contrary to Vintgar, you are not stuck against other tourists on a small trail LOL. Lake Bohinj is also a great destination in winter for those who love skiing. Mount Vogel is a ski resort with 26km of slopes. Most accommodations in the area have facilities to handle your skiing equipment.